We’re getting pummeled with rain on the east coast this week, I’m thinking ahead to lazy dreamy Summer days. Afternoons spent swimming at the lake followed by late nights watching movies and eating popsicles on the living room floor. In anticipation of the weeks ahead and in honor of Film Friday, I put together a top five movie list every photographer should see. I included a mix of classic and contemporary films and while there were many others I jotted down for the list, I thought it would be more fun if you played along too. 1. Blow-Up (1966) directed by Michelangelo Antonioni. 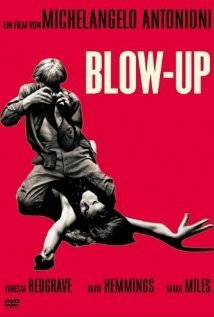 A must-see film inspired by Julio Cortazar’s 1959 short story titled Las babas del diablo translated as “The Devil’s Drool” or “Blow-up”. Thomas, a British fashion photographer played by David Hemmings, accidentally captures the commission of a murder on film. Renessa Redgrave and Sarah Miles also star in the film which takes an insider’s look at London’s fashion scene and mid-sixties mod society. 2. Rear Window (1954) directed by Alfred Hitchcock. Another classic involving film and murder. James Stewart plays the role of Jeff, a wheelchair bound photographer who after spying on his neighbors from his apartment window grows convinced one of them has committed murder. 3. 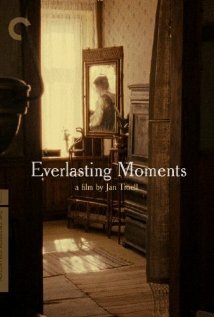 Everlasting Moments (2008) directed by Jan Troell. Inspired by a true story, Maria Heiskanen stars as Maria Larsson, a Finnish mother and housewife who spends all her time taking care of her family. Her relationship with husband, Sigge (Mikael Persbrandt) is troubled. He’s works the docks by day and makes their family life a raging storm by night with fits of drunken rage. Sigge loses his job when the dockworkers go on strike and as their economic situation sinks into desperation, Maria discovers she won a Contessa camera in a local lottery. When she tries to sell it in a pawn shop, store owner Sebastian Pedersen persuades her to keep it, a decision which changes her entire life. 4. La Dolce Vita (1960) directed by Federico Fellini. The film centers around a series of stories following a week in the life of Marcello, played by Marcello Mastroianni, a philandering paparazzo journalist living in Rome. Dissatisfied with his work and personal life, he throws himself headfirst into the hedonism unfolding around him. Also starring Anita Ekberg and Anouk Aimee. 5. Gregory Crewdson: Brief Encounters (2012) directed by Ben Shapiro. I’ve long been fascinated with photographer Gregory Crewdson’s process. He shoots large format cinematic images that are elaborately staged in the small towns of Western Massachusetts or in elaborately recreated interior spaces built on sound stages just like big-budget movies. A narrative strand runs through his work. Shapiro profiles the artist and includes stories of his childhood in Park Slope, his summers in the country, and his introduction to Diane Arbus’s work. I would also highly recommend the documentary The Woodmans, “a portrait of the late photographer Francesca Woodman, told through the young artist’s work (including experimental videos and journal entries) and remarkably candid interviews with her artist parents Betty and George (a ceramic sculptor and painter/photographer), who have continued their own artistic practices while watching Francesca’s professional reputation eclipse their own.” Very moving, with Francesca’s amazing images. Lucy, I’m so glad you suggested The Woodmans, which I hadn’t heard of. As a fan of Francesca Woodman’s work, I and can’t wait to watch this one! Thank you for the suggestions! Will be adding a few of these to my queue. – War Photographer, about James Nachtwey (http://www.imdb.com/title/tt0309061/) — really inspiring, but really intense and not to be watched with young kids. I’ve read that War Photographer is a good one, albeit tough to watch. Adding What Remains as well and Bill Cunningham’s New York is great! yes bill was awesome! really inspirational, and about NYC so whats not to love? 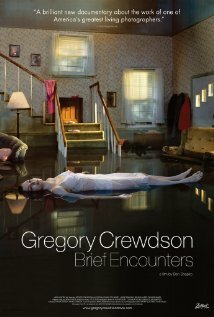 looking forward to checking out the Crewdson, he & his work fascinate me as well. Thanks and I think it’s so true, the intimate connection between photography and film…looking forward to reading your picks! I haven’t seen any of these! Now, to carve out some movie time that doesn’t include Matter, a princess, or a large yellow bird. i loved Blow-up, Rear Window (oh Grace Kelly!!!) 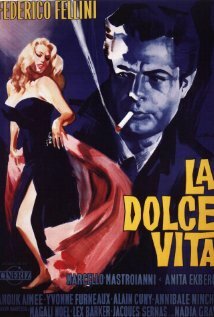 and La Dolce Vita and must see the other 2!!! some of my favorites are The Eyes of Laura Mars (starring Faye Dunaway and Tommy Lee Jones), The Year of LIving Dangerously (Sigourney Weaver, Linda Hunt and Mel Gibson), High Art (can’t think of her name), Funny Face (that sweet face, Audrey Hepburn and names that are escaping me) and the Closer (Natalie Portman, Clive Owen, Julia Roberts and Jude Law)! What a wonderful piece this is–got me thinking and i love the suggestions that have been made by Deirdre and Lucy as well!!!! I haven’t seen The Eyes of Laura Mars but read about it, adding it to my list. I read The Year of Living Dangerously but need to watch the film. High Art and Funny Face are bot great and I have yet to see Closer. Great suggestions! I’ve never seen any of these films, so they are all new to me! Awesome spin on a film friday post! LOVE IT! I’ve loved many of these, Bill Cunningham got 5 stars from me, and Pecker, oh good heavens! I’ve been meaning to watch that again since I got serious about photography. A few more documentaries: An American Journey, about revisiting the tour Robert Frank took in making his famous “The Americans” series, and Visual Acoustics, about the work of Julius Shulman, the man who photographed almost every iconic modern architecture photo you can imagine. I’ve seen some of these but not all, so thanks for the recommendations! I recommend Bill Cunningham New York and The Woodmans (and Visions of Light which is in my Netflix cue but I haven’t watched yet). What a great idea for a post Nikki!! As I put together my summer reading list, this has got me thinking. Any wonderful books about photography/photographers you all can recommend? Maybe it’s fodder for a different post . . . I can recommend Songdogs by Colum McCann – beautiful but dark. A grown son tries to makes sense of his father and his childhood, in part by examining father’s photographs. The Bang Bang Club is another film to see. 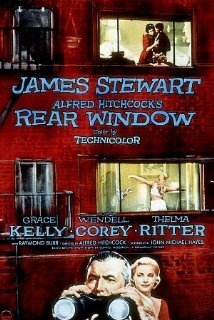 I love Rear Window, so I must see if I can find the others to view! Thanks for the recommendations.